I am sick of hearing about the Federal Reserve. It's the Fed this. The Fed that. The Fed, Fed, Fed. It's amazing to me how talking heads on TV practically hyperventilate on air mid-sentence talking about what the Fed might or might not do. Everyone is so focused on interest rates. Too focused. The thing is, they're focused on the wrong interest rate. While the federal funds rate has seen little movement and may not budge much for the rest of the year, three-month LIBOR is at multi-year highs! LIBOR stands for the London Interbank Offered Rate. It's a really, really important interest rate. Jim Rogers has seen the future of America… and it's shocking. According to his analysis, we are about to witness the biggest economic collapse since the Great Depression… and perhaps ever. How can he be so certain? In this exclusive Wall Street Daily interview, Rogers explains everything with just nine stunning images… and nine words from the Bible's Book of Joshua. For details (including how to prepare), please go here now. When investors borrow money and use their portfolio as collateral, the loan is often priced at LIBOR plus some base interest rate. For example, the loan might be priced at LIBOR plus 2%. These loans are NOT priced based on the federal funds rate. Now that LIBOR is rising steadily to multi-year highs, these loans are getting more expensive to maintain. Recently, I took out a LIBOR line of credit and used it to buy a house for my elderly father so that he could be closer to family and better attended to. I've never used a line of credit before. I come from a family where I was raised to pay in cash. If I don't have the money and can't pay cash, then I don't get it. No one gets rich paying 18% on a credit card with money they don't have for stuff they don't need. I have never paid a dime of interest on a credit card. But this was a unique situation. I could access 60% of my liquid assets with a credit line and borrow the money very cheaply. It was way cheaper than getting a mortgage. The other benefit is that this is cash, so when I shopped around for a house for my Dad, I could immediately make a cash offer. This leads to better deals because there are fewer contingencies. The seller will almost always take less. Unlike most people, I also intend to pay off the credit line quickly. I gave myself a year to wind it down and in four months I have reduced the leverage by 60%. That's not what most people do, and here's where it gets a bit sticky. A major Wall Street firm extended the credit line to me. Yet, no one ever asked me what I was going to do with the money borrowed from the credit line. I could have told them I need $500,000 because I'm going to Montreal for the weekend and I'm going to have a lot of fun! The money would have been wired immediately. You see, people with portfolios of liquid assets get access to these credit lines. That means people who own stocks. You often must have more than $1 million in stocks and bonds to get access to LIBOR-plus loans. They can buy a new house like I did or finance a large purchase of an illiquid asset by using their portfolio as collateral. These assets might be boats, planes, fine art, or investable wine. You name it. The problem is, as interest rates creep up and more portfolios have been used as collateral to finance asset purchases, it could create a huge storm if stocks and bonds take even a minor dip. If stock prices slide, the borrower could get margin calls. Then they have to sell stock. But, they also have to reduce their leverage because you can only borrow so much against the portfolio. The assets bought are often illiquid and can't be easily sold. So, everything unravels at once. This accelerates the selling pressure. There are trillions of dollars of these credit lines that investors have tapped. Rising LIBOR and any sort of snafu in the market could be the catalyst for a major decline. While everyone has their eye on the Federal Reserve, it's really the inching up of LIBOR that should be scaring market observers. P.S. Regardless of what brings the market down, the fallout will present you with some life-changing opportunities. Harry gives you the details of these in his new book, The Sale of a Lifetime. Get it now so you can prepare. P.P.S. Join Harry on Facebook, Wednesday, September 28 at 11 a.m. EDT for a Q&A session. 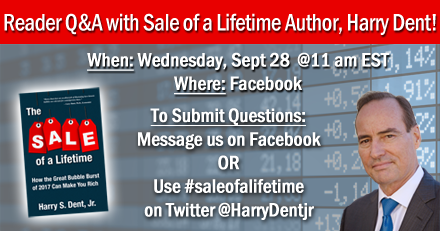 Be sure to send your questions to Harry via Facebook at https://www.facebook.com/EconomyMarkets/ or tweet @harrydentjr and use #saleofalifetime.